The Clover Pendant Double is made from sterling silver sheet which has been scored and folded to create a 3D form. 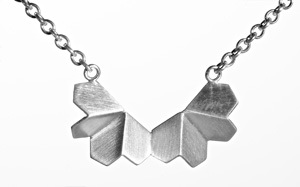 The Clover Pendant Double is made from sterling silver. This item will be handmade to order and dispatched within 2 working days.